Is turkey good for you? If you have a traditional Thanksgiving dinner planned for next week, I have very good news for you. Blood body types have a need for harmony, and will become physically ill if emotionally upset. This month we look at what's unique about the Blood body type. Harmony Essential Oil Blend is the second of the 6 oils in the Young Living Feelings Collection, which we are exploring individually. Turkey - Is It Good For Me? With the holiday season just around the corner, I’m sure many of you are planning a traditional (or non-traditional) Thanksgiving Day turkey dinner. 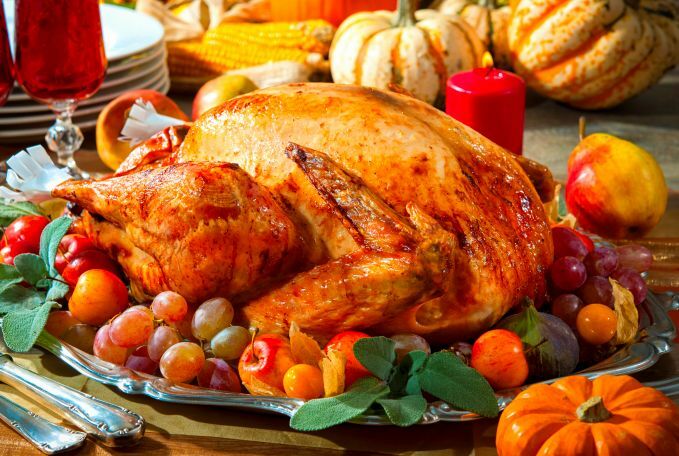 Turkey is a food that we associate with Thanksgiving, and most people seldom eat turkey at other times of the year. From a nutrition standpoint, how good (healthy) is turkey? Read on, I have good news for you. Interestingly enough, turkey is one of the very, very few foods that are very supportive for all 25 body types. In fact, there are only two dense protein sources that are ultra-supportive for the Intestinal body type – and turkey is one of them. And it is THE most supportive food for Pituitary body types. In the food lists of the Body Type Diet & Profile booklets (or the Quick Reference Cards), “ultra-supportive” indicates foods that can be beneficially eaten at 3-7 meals per week, while “supportive” means 1-2 meals per week. Of the 25 body types, turkey is ultra-supportive for 12 and supportive for 8. For the Spleen body type, turkey is an excellent source for all 3 amino acids. For several other body types (Adrenal, Balanced, Intestinal, Lymph, Pancreas, Pineal, Thalamus and Thyroid), turkey is an excellent source for fats. Turkey is ultra-supportive for Brain, Lymph and Medulla body types, but only if it’s clean (chemical free), as these three body types are highly sensitive to chemicals. The large size of turkeys often produces holiday leftovers to snack on. Turkey soup, turkey sandwiches or wraps, turkey tetrazzini, and other creations make their appearance in the days following Thanksgiving. Normally, rut eating depletes digestive pancreatic enzymes. However, since turkey is such a supportive food for all body types, you can enjoy the leftovers without concern. Keep in mind that turkey leftovers keep about 4-5 days in the refrigerator, so if keeping them longer, be sure to freeze them. Turkey is a uniquely north American game. We often associate it with the early Pilgrims. However, the 1621 Pilgrim celebration at Plymouth, widely considered to be the “first Thanksgiving”, is simply described as including “wild fowl”. Although wild turkeys roamed the area around Plymouth, the “wild fowl” at that harvest feast could just as easily have been duck or geese. The Thanksgiving tradition informally endured over 200 years before Thanksgiving Day was declared a national holiday in 1863 by President Lincoln, although it had been regionally recognized and celebrated long before that. Alexander Hamilton once remarked that, "No citizen of the U.S. shall refrain from turkey on Thanksgiving Day." The Pilgrims didn’t enjoy today’s staples such as yams or mashed potatoes, since white and sweet potatoes were not readily available to them. The first mention of cranberry sauce wasn’t until 1663, since the necessary ingredient of sugar was a rare luxury to them. Pumpkin pie may have been enjoyed as early as 1623, but in 1621 the Pilgrims most likely didn’t have flour or butter to make pie crust. So enjoy your turkey, and have a wonderful Thanksgiving Day! Are You a Blood Body Type? Celebrities with Blood body type include Roma Downey, Tiger Woods, Jack Nicholson, and Phylicia Rashad. If this describes you, you could be a Blood body type. Blood body types are typically medium height, with expressive, receptive eyes that immediately draw attention to the face. Women are typically short-waisted, and men display a high forehead with an early receding hairline or thinning hair. Initial weight gain for women is in the lower abdomen, waist, and upper hips and thighs. Men’s initial weight gain is a soft layer in the lower abdomen, and as soft rolls around the waist. Blood body types are sensitive and nurturing, with a genuine concern for others who aren’t able to speak on their own behalf, drawing them to the young, disabled, animals and nature. They are highly sensitive to disharmony within their physical and emotional environment. They are highly self-motivated, responsible and efficient at completing tasks or projects, and are meticulous about details and research. The primary nature of Blood is physical / emotional. For Blood body types, exercise helps to clear the mind and release emotional stress. Moderate exercise helps with weight loss, and improves vascular integrity. Heavy exercise is not recommended as it can easily fatigue Blood body types. Swimming, rebounding, bicycling, walking and dancing are recommended exercises. 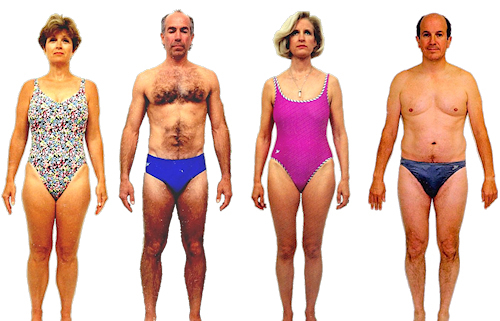 Torso muscular definition can be difficult for Blood body types to attain, due to soft layers over the muscles. To prevent fatigue, Blood body types should emphasize proteins at lunch, and vegetables and carbohydrates (such as pasta and rice) at dinner. Fruit should be limited to breakfast. Avoid olive oil. Turkey is an ultra-supportive food for Blood body types when it is combined with celery, mustard or bacon. To lose weight, eliminate all dairy except butter, reduce breads, and avoid vegetable oils and mayonnaise. 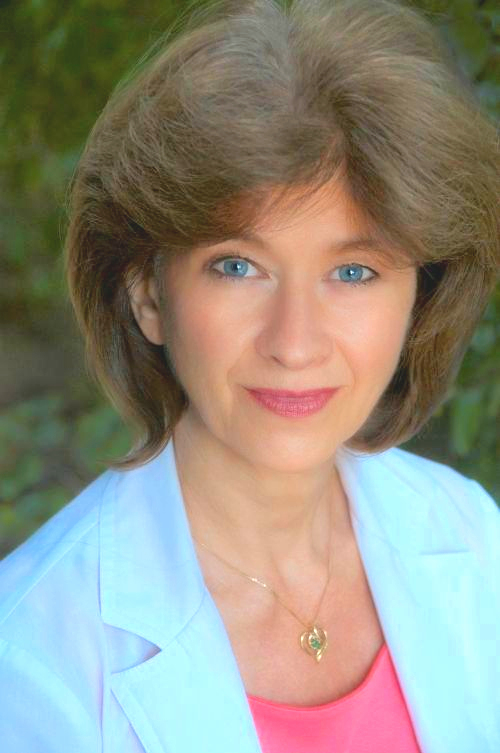 The core emotional issues for Blood body types are Disharmony, Conflict, and Trapped. 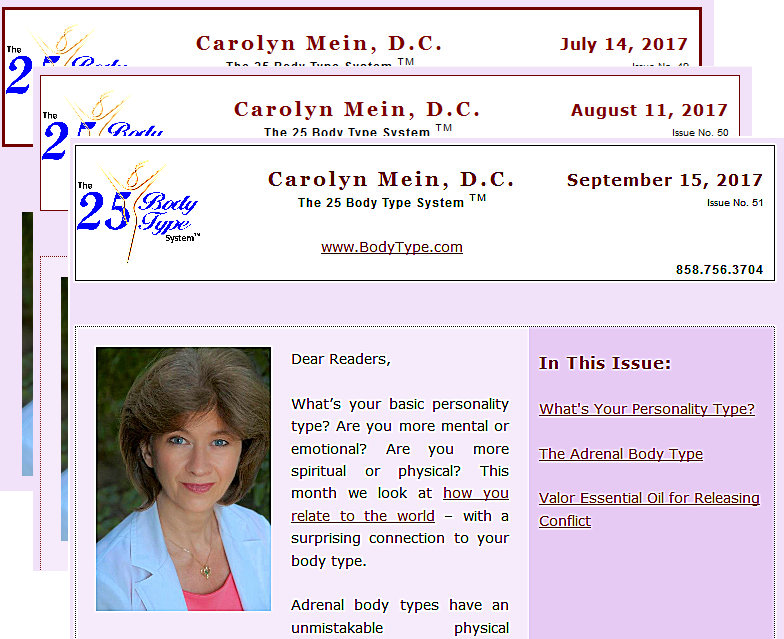 To learn more about the Blood body type, see the October 2015 Newsletter. The featured essential oil this month is Harmony. The Feelings Collection by Young Living contains 6 oils that will take you through a process of releasing emotions. Lasst month, I talked about using this kit and how to go deeper into resolving emotional challenges. The first oil is Forgiveness, which is the first step - forgiving the other person, asking them to forgive you, and forgiving yourself. The central theme is Truth. To make changes, you need to know what is true. It is from this position of truth that you can learn from life's experiences. The second oil is Harmony. Harmony brings about Elevation, giving you an opportunity to rise above the situation. Forgiveness opens the door for harmony, allowing you to rise above the pain and hurts to value life. Emotions that need Harmony are: the fear of being ignored, crushed, hostility, punishment, beating self-up, sarcastic, and stubborn. Start with the emotions that hold the greatest change. As you clear each one, using the technique demonstrated in the video below, you can experience the next one surfacing. Clear each one as it comes into your awareness - it is quite common to go through each emotion. Continue clearing the emotions as they surface until you are no longer triggered by the things that normally set you off. A good way to clear the emotions is to go throught the process of clearing by feeling both sides of the emotion and saying the affirmation, repeating the technique for each emtion, as a ritual before you go to bed at night. You can repeat this process in the morning, when you are setting your intentions for the day and then throughout your day whenever you think about it. Harmony is a blend containing geranium, rosewood, lavender, sandalwood, frankincense, orange, lemon, angelica, hyssop, Spanish sage, jasmine, Roman chamomile, bergamot, ylang ylang, palmarosa, spruse, and rose. The nature of Harmony essential oil is to promote physical and emotional well-being by creating a harmonic balance to the body's energy centers. It brings us into harmony with all things, people, and cycles of life. It can reduce stress and increase our overall feeling of well-being. Harmony combats feelings of discord and is uplifiting and elevating to the mind, helping to create a positive attitude. Harmony can be used aromatically by diffusing. It can also be applied to ears, forehead, wrists, bottoms of the feet, over the heart, at the base of the neck, or at the back of the head. It can be applied to areas of poor circulation. Those with very sensitive skin may experience slight skin sensitivity to this oil and should dilute it with a drop or 2 of carrier oil before applying.